Lama Zopa Rinpoche in Singapore, March 2013. New Issue of Mandala Out Now! 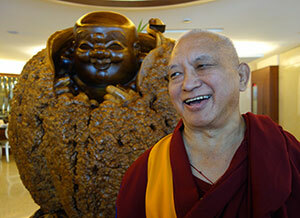 Lama Zopa Rinpoche with a Buddha statue carved out of a single piece of wood, Taiwan, March 2013. Recent live webcasts of Rinpoche teaching in Asia are available to watch anytime on Livestream. “Thank you 10 times for so kindly offering this; it is a pity I am so useless, but I do try to benefit some ants and did in Washington retreat place during the snow time. Also try to help the cockroaches. And maybe next life those creatures will come back with rucksacks to the Kopan Course. Also go to Lawudo … and then eventually get enlightened … he he he, ha ha ha, ho ho ho! Anyway I really appreciate all your efforts! “Zillion million thanks for the retreat and mantras you all did! Very, very kind; I pray to be a little benefit at least to sentient beings – the ants and cockroaches and many other little and big sentient beings. 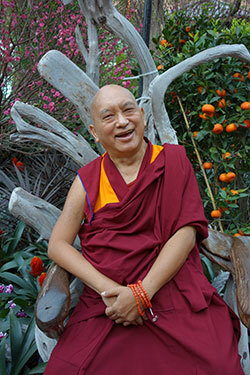 Find a full range of advice from Lama Zopa Rinpoche on Rinpoche’s Advice page.Go to the Lama Yeshe Wisdom Archive for lots more advice from Lama Zopa Rinpoche. 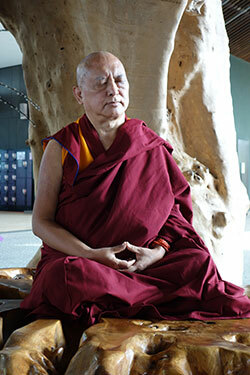 Lama Zopa Rinpoche meditating in Singapore, March 2013. Subscribe to our RSS feed on Rinpoche’s Schedule to receive updates automatically as soon as they are available! Here’s a video from that night of Rinpoche discussing karma at the food court. 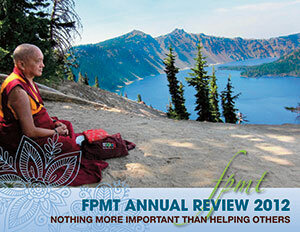 Click on the cover image above to find the FPMT Annual Review 2012 in ezine format. We invite you to rejoice with us as you read our 2012 annual review entitled FPMT Annual Review 2012: Nothing More Important than Helping Others. “Identifying this year’s theme for our Annual Review was fairly straightforward. All we had to do was look at Lama Zopa Rinpoche’s activities and advice from 2012 and it became clear that nothing is more important to Rinpoche, and thus the entire FPMT organization, than helping others. It is available now to read online as an e-zine or downloadable PDF. We will be mailing printed copies to FPMT centers, projects and services soon. Congratulations, Graduates of Basic Program! On February 15, Nalanda Monastery in France held a graduation ceremony for its first five-year residential Basic Program (BP) students. Geshe Jamphel, BP teacher and Nalanda’s abbot, handed out BP completion certificates to the graduates, and BP completion cards to students who did not yet fully graduate. The ceremony was an inspiration for the 36 brand new students of Nalanda’s second Basic Program, who attended as part of their introduction day. The ceremony was followed by a big celebratory lunch. Two of these graduates are now FPMT registered teachers! Nalanda Monastery will be offering the FPMT Masters Program, an in-depth and full-time study program, starting on September 2, 2013. Nalanda is now accepting student applications. We are happy to announce the French publication of The Preliminary Practice of Altar Set-up & Water Bowl Offerings from Service de traduction de la FPMT. 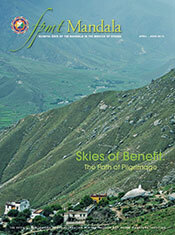 The April-June 2013 issue of Mandala magazine has just been published, and it’s an issue not to be missed! In it, we explore the path of pilgrimage, including valuable advice from Lama Zopa Rinpoche; gorgeous photos of pilgrimage sites in Tibet, China, India and Nepal; and personal stories from FPMT students and teachers. Also in this issue, a rich assembly of articles and news from the education programs, centers, projects and services around the world that comprise the FPMT mandala. If you aren’t already receiving Mandala, it’s not too late to get a copy. By signing up now to become a Friend of FPMT at the Basic level or higher, we will send you this issue as well as an email with a link to the electronic version, which you can read right away. For more, visit us online at fpmt.org/mandala. Become a Friend of FPMT and stay connected to all the FPMT has to offer including the FPMT Online Learning Center, Mandala Publications and many complimentary resources offered at the free FPMT Membership level. Justin has joined the International Office team as Donor Services Coordinator, taking over from Trevor Fenwick, who has resigned. Justin is a graduate of Naropa University where he received his B.A. in Religious Studies as well as Maitripa College where he received an M.A. in Buddhist Studies. Lama Zopa Rinpoche offered lunch to Choden Rinpoche during Monlam, Taiwan, February 2013. Get a 40% discount when purchasing The Practice of Virtue Card. Translated by Lama Zopa Rinpoche, The Practice of Virtue is a frameable one-page prayer reminding us of the power of karma and importance of virtue. Needed! A project manager for the stupa to protect from harm in California, USA and a treasurer for Foundation for Developing Compassion and Wisdom, UK. Milarepa Center, Vermont, USA has four work-study positions available. Please check out these and other exciting opportunities to offer service as a volunteer or as paid staff in FPMT centers, projects and services around the world!